Basic Red Curry Paste or Prig Gang Kua is the curry paste from which nearly all the other curry pastes must have evolved; red curry paste, panang curry paste, namya curry paste, choo chee curry paste, green curry paste and prig king curry paste are all riffs on or add additional ingredients to Prig Gang Kua. 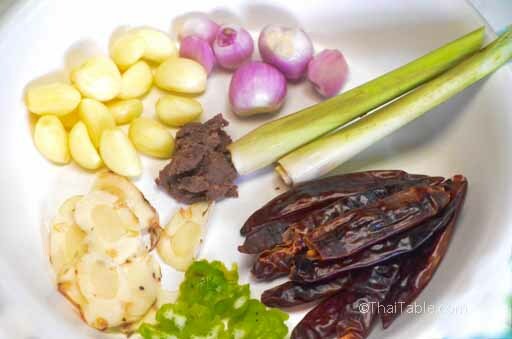 The ingredients in the basic curry paste are common in kitchens throughout Thailand. The paste is bright orange with the aroma of Thai herbs and spices. 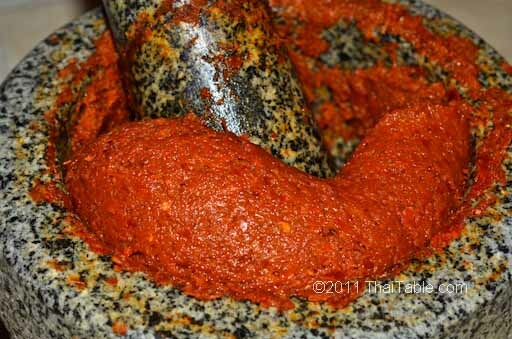 Basic Red Curry Paste makes 'gang kua' or curries which is often has added grilled fish, dried smoked fish or dried shrimp. Some gang kua add sour agents like kaffir lime juice, pineapple or tamarind. Another characteristic of gang kua is that it can have a hint of sweetness from sugar. The southern gang kua has added fresh turmeric and not as watery as other regions. 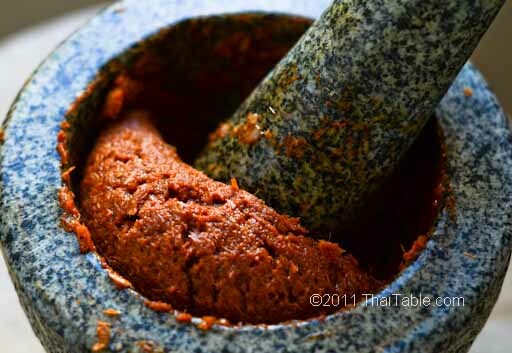 See how Basic Red Curry Paste differs from Red Curry Paste. Kaffir lime zest is optional. Some recipe calls for it and some don't. 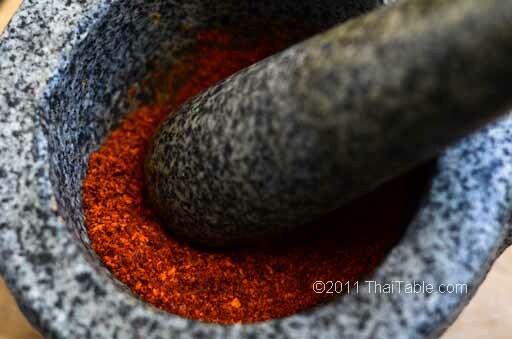 In making basic red curry paste and other curry pastes, the one most difficult-to-find ingredient is kaffir lime zest. Please do not substitute kaffir lime leaves for the zest as you would not substitute lemon leaves for lemon zest in lemon meringue pie. Kaffir lime zest has a distinct scent and flavor and regular western limes are an ineffective substitute. Skip the kaffir lime zest if you can't find the lime. The technique to using a mortar and pestle is to pound down at an angle then drag it, grind and twist it up toward yourself. Use the other hand to cup the opening, to both prevent the contents from bouncing out and steady the mortar. Then pound and pound and pound. 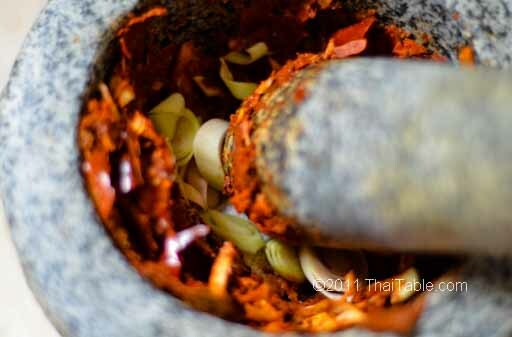 It will take a lot of grinding to make smooth curry paste. In Thailand, almost every mother would teach you to seed and soak the dried chili peppers in water before pounding. However, my mother loves technologies and experiments, she found this method messy and harder to grind. Instead she puts her dried chili peppers in a toaster oven for 5 minutes to get rid of the moisture. Once when the peppers are super dried, they are crunchy and easier to grind. Without the water, it's not as messy (picture 2). Cut and soak the dried chili peppers. I use Anaheim peppers which are very large and mild compared to the dried Thai chili peppers. Slice shallots, lemongrass and galangal into small pieces. I use one stalk of lemongrass. Peel off the hard outer leaves. Slice thinly or grate the kaffir lime zest. They will grind into a fine paste with smaller fibers. Pound the ingredients into the side, almost at the deepest spot, at a 65-degree-angle. Do not pound straight down into the center of the mortar; things will bounce back at you. Pound and drag out the pestle to separate the fibers. The sequence of ingredients added to the mortar is hard and dry to soft and wet. The hard ingredients, with the least amount of water content go in first. Squeeze out the water from chili peppers. Pound the chili peppers and salt. Salt acts like pebbles, breaking up chili pepper into small pieces. Pound the chili peppers into a paste (See another method of pounding chili in Tips and Techniques -last bullet). Add lemongrass and galangal into the mortar. Grind them into rough fibers. Add garlic and kaffir lime zest next. Pound the mixture into a paste. Leave the shallots for last. Once when shallots are added, the juice in shallots makes it slippery to grind other ingredients effectively. Pound until the mixture turns into a fine paste so that you can’t recognize individual ingredients. Then add shrimp paste. Pound to mix it in the paste. It took me a good 20 minutes of straight pounding; this is when you develop your perfect arms! The salt performs two roles in curry pastes, it helps with grinding and acts as a preservative. Most curry dishes use fish sauce or some other salt, so you may add more salt to the paste when you're making it than what’s called for, you just need to remember to taste what you're making prior to seasoning.